A Message From My Parents On Easter 2016. Yesterday I had a good example of my parents communicating to me from the spirit world. A friend sent me an Easter card and in it they had the video of the song “Here Comes Peter Cottontail.” I had forgotten about this song long ago and how my parents would play that song for me when I was a little girl. The moment it started playing I started crying because of the memories that it brought back of a time when life was safe, secure, and filled with love. So I take it as their way of saying hello when I really needed it. Thank you Mama and Dad. You knew I was feeling alone and it was your way of letting me know I was still loved. You were the best parents anyone could ever have. I look forward to the day that we are reunited once again. So many people write to me and want to know how to communicate with a deceased loved one. The way the departed communicate is quite different than what we are use to in this third dimension. So if you start looking at subtle messages, such as the one I received you might start seeing that you are being contacted by your loved one. One of the most frequently asked questions that I receive is: Is it possible to communicate with a loved one who has passed away and, if so, how to do it. Loved ones usually try to get messages through to us to let us know how they are doing. They will communicate through psychics. They will try to appear to us. Sometimes they will come to us and project a smell that will remind us of them. Other times we will be sitting quietly and we will intuitively know they are there with us. They also work through electricity – turning TVs and radios on and off, affecting lights, doorbells, phones and computers. They seem to be able to manipulate energy – most likely because they’re energy! How I started being able to communicate with the deceased started with my father’s passing in 1994. He passed away in the morning. The following morning as I awoke he was screaming into my right ear everything he wanted to me to know. I woke up saying, “Dad, you’re hurting my ear. Stop talking so loud.” I then did my best to remember exactly what he had been saying. It amazed me. I had never had such a spiritual connection in my life. Over the next few days he appeared to me, each time with a message. Yes, he actually was visible on his appearances the week following his death. Throughout the years he has continued to communicate and on rare occasions I have been able to see him. It’s absolutely fascinating. I moved into a house in 1998 that had been custom designed by a paraplegic. He had died in that house. It only took a few days after moving in before he started manifesting his presence by turning on lights. From there a multitude of spirits started coming around. Sometimes as I would be sleeping there would be many walking around my bedroom quietly, but the sound of the carpet moving would wake me up, I could actually see them at this point, and I would ask them to please be quiet and they always cooperated. 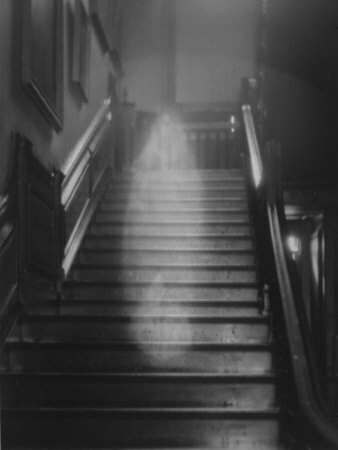 I continued to have many spirits visit me in this house. The more I worked as a professional psychic I started receiving messages and images from the other side. I finally had a client ask me if I could communicate with her son who had been killed in an automobile accident. I told her that I would try. What came through amazed not only me, but her. I was able to tell her so much about what he felt and how happy he was now. Then it hit me that talking with the deceased is really no different then doing a psychic reading. I cannot see the person I am doing the reading for – we are connected through wires, satellites, and radio waves. I am able to connect to the other person (their spirit) and get answers. From this realization I found the answers from the other side started coming faster. I am a guide standing at the threshold of the other side. I have no knowledge of your interlink. I am only a voice from this world to the other world. Is there someone waiting? Is there another who wishes to speak to you? Is there one on the other side you want to talk to? I can give you nothing more than what the other world wishes to convey. I am merely a connection from the inner or outer world to you. I can make the interlink between you and the other side because I stand in the shadowy realm between both worlds. Although I will seek to receive the message from your loved one that has passed, sometimes the message comes from one or others that I did not seek. I can only pass the messages to you that I am given. The strongest messages come through which are not always from the one I asked to speak with. Accept the message from no matter where it comes, because it was given for a reason. Spirits or deceased loved ones don’t all speak. Some think to us, in other words their messages come through as thoughts. They also communicate with us through images, pictures in our minds. Again, interpretation is the key. When we go to the other side, we go to a different culture, there is a prevailing calmness over there. The day-to-day dramas don’t exist as we know them. Souls on the other side aren’t caught up in the daily struggles we are or in the deep need to survive. They realize they have survived, and they see life here as a series of experiences to learn from. They don’t always cling to the memories the way we have a tendency to do. They experience everything in present tense. There are no clocks or calendars, no time as we think of it. Yes, souls on the other side do have memories; they remember some of their yesterdays, but they’re not necessarily the ones we remember. Finally, remember that departed loved ones may be having just as hard a time as we are accepting their deaths. It’s very important to respect their process. Pulling on them too hard makes it harder for them to move on. If you are having a difficult time with the loss of a loved one, don’t ask your loved one to comfort you. Seek out someone here who can help you. Angels and Spirit Guides come in all shapes and sizes, and from many dimensions. The Angels keep us connected with our Source, and our Guides help us find the way back home. Angels are essentially messengers, conduits between us and our Source. Angels may have manifested here on planet earth, but always as angels, never as humans… Many Spirit Guides have lived here on planet earth as humans… some are ancients, carrying the wisdom of the ages, making it accessible at various times in our evolution as a species, as we have needed it, and been able to receive it… some guides are healers, intent on helping us relieve our pain and clear the fears that get in our way in life, some guides are entities from other dimensions who have chosen to participate in the transformation of planet earth… perhaps they are the representatives of our Higher Selves. There are countless different kinds of angels and guides at work with us at any moment. So, how do you know whether you’re connecting with an angel, a guide or your Higher Self? I don’t think it matters… I don’t know about you, but I’m open to loving support from any direction….. while I find it useful to get a name, and to understand the purpose in a particular guide or angel’s presence in my life, this is just so I can more easily tune into their vibration and recognize them in the future… Most often I really don’t know how exactly they have intervened; I simply see a prayer answered. The angels and guides around me have answered so many of my prayers, in so many astounding, at times, miraculous, ways that I know it is important – and so very worthwhile – for you to make your own connections. Let me show you how to connect to your Angels and Guides. It’s fun and fascinating and will open up a whole new life for you. What Did You Think Of The Radio Program? I’m sure that many of you were able to listen to the radio program with Anna and our special guest Heidi this evening March 11. I would love to know what you thought of our program and your comments and feedback. If you have any topics you would like to suggest for future programs I would love to hear about them. I just wanted to let you know how much I appreciate all of your messages and videos that you share here on my blog. The love you show each other is so wonderful. Each one of you is very special and trust me the Divine Spirit sees all of your love and you will be blessed. I want you to know that I will not be able to respond to any of your comments for the next week. I’m undergoing medical procedures and will be away from my computer most of the time. So if one of your posts needs approval be patient and I will get back and approve it as soon as possible. Please keep me in your prayers as I certainly need them.